The work is intense. One lady sits by the fire all day long mixing the paste, spreading it over the hot plate, removing it with what seems like a huge butter knife, placing it on a bamboo wheel. It is then the second member of the team who spins the wheel, removes the wet disc, and places it on the bamboo bed alongside all the rest. This process takes about thirty seconds for each one and for one hundred they earn one dollar; less expenses. If they have a buyer of course. The next village makes banana sheets. Thinly sliced banana laid out next to each other to form what could be described as banana paper. Once this is dried it is rolled up and eaten as a snack. Tedious work but at least there is no fire you have to accompany every waking moment! Bricks. Who would have thought that brick making was a big part of Cambodian life. Another village dedicated solely to shaping the bricks, baking them, and distributing them. The kilns loom large on the landscape and appear as igloos from a distance. Not since Bali have I seen such a clear cut village occupation. There the famed wood carvers carve and paint birds, animals, furniture, mobiles, motorcycles, you name it. All in distinct villages. Todays outing with Mr. Scorpio was to be half as long as the first but he did have one other place of interest to show me. This is another reminder of the horrific Khmer Rouge era. A Killing Field with a memorial filled with skulls and bones of the victims. At the entrance to a primary school! 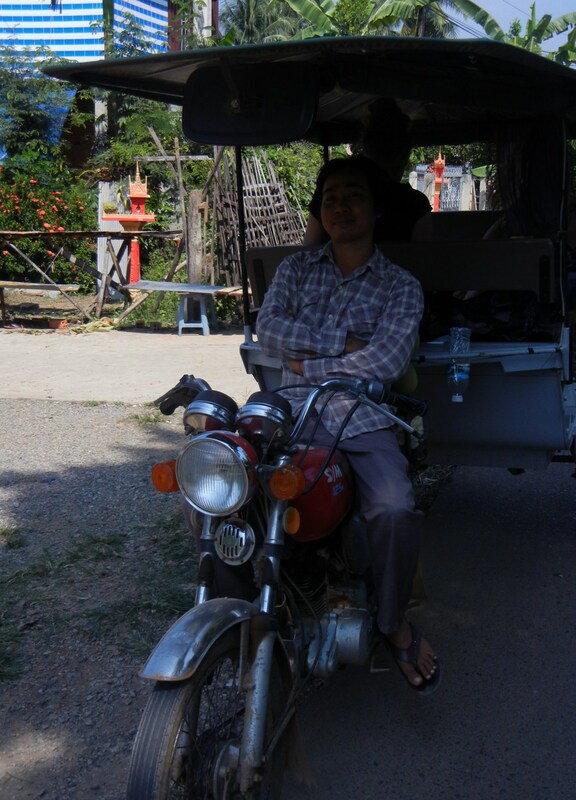 Tonight I leave Battambang on the Hotel Bus. A sleeper bus that will whisk me, overnight, down to Sihanoukville for some time at the beach and in the sun. I feel bad for the lady who has to slave away all day to earn $1. What an interesting story Tim. Thanks for sharing it. A side of the country that so many people don’t get to or try to see. I’m planning on visiting Cambodia this winter and I’m so excited! Oh wow I had no idea that rice paper making was so intense! Your description and inclusion of the pay rate really brings a perspective that most of us, as North Americans, really can’t even begin to imagine. Thank you for sharing. Another fascinating post Tim, I really do enjoy reading your articles. So interesting (and sobering) to learn about the kind of work people do in Cambodia – I find it shocking the wages they are paid, and that they aren’t even guaranteed! Thanks Paul. Cambodia is a very sobering and thought provoking country for sure. I appreciate you reading the blog and hope I can keep the stories flowing.